Today we'll bring Twilio Sync for IoT to 4G using the Arm Mbed Online IDE and a Multi-Tech MultiConnect® DragonflyTM. 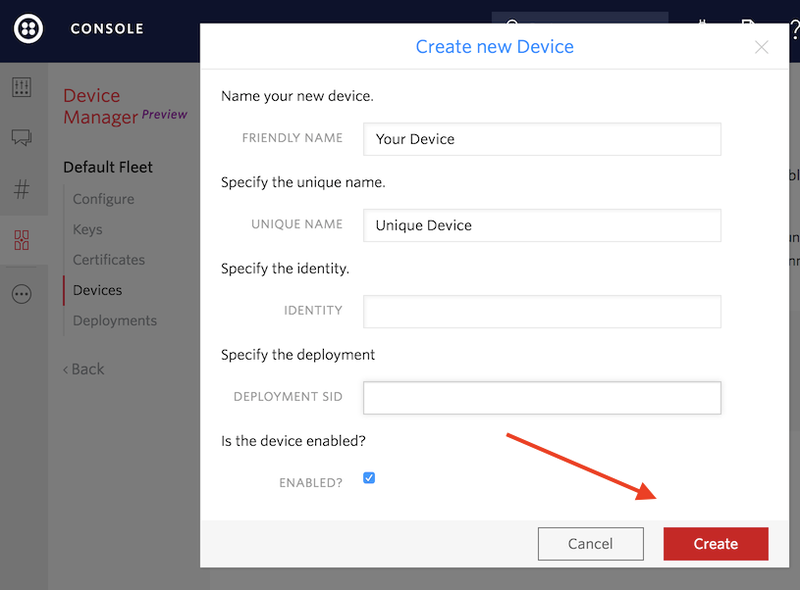 We'll use the Twilio Device Manager to create a Device Fleet then a connection to Sync. We'll do all of that using Twilio's Programmable Wireless cellular connectivity. And what are we going to do with all of that power? Blink an LED, of course! Create a new Twilio account (you can sign up for a free Twilio trial) or sign into an existing Twilio account. Once logged in, click the Twilio Device Manager link to go to the Sync for IoT console. The code in this Quickstart will work with 4G via Twilio's Programmable Wireless. You can order SIM cards here directly from the Twilio console. Once your SIM has a rate plan with data enabled insert it into the board's SIM slot. Additionally, attach the cellular antenna to your board. 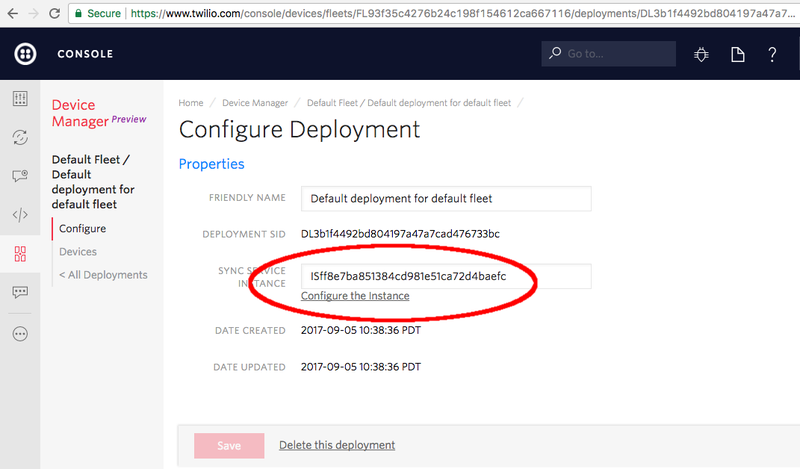 Device Fleets are collections of devices, keys or certificates, and configurations of Twilio Sync. You may create many fleets, but each individual fleet will be isolated. Let's move next to the Deployment. Twilio also creates a default Sync Service Instance. Instances are similar to isolated databases. When you make an update on a Sync primitive (such as a Document), the update only affects the named primitive in this Instance. 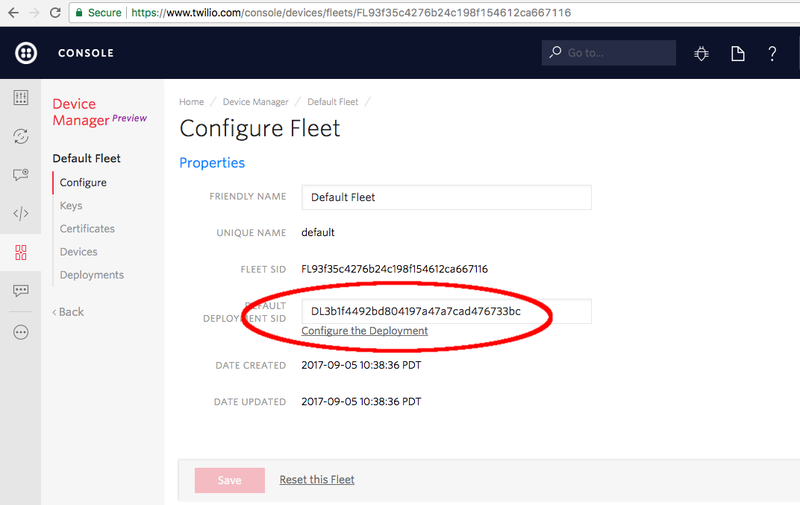 As before, you can create and configure a Deployment with the API. Deployment handled, next create a Device and Device Key. For Sync for IoT, a Device is one piece of hardware managed through the Device Manager. When connecting to Sync, Twilio identifies your device either through a key or certificate. Today we'll be using a Device Key to authenticate with Sync. While inside your Fleet, on the left sidebar click the 'Devices' link. Enter a Unique and Friendly name for the board then hit the 'Create' button. You can also create and manage a Device through the Twilio API. The Device Sid should automagically be populated, so enter a Unique Name and 'Create'. Note: Save both the Key and the Secret - once the secret is lost, you can't recover it! 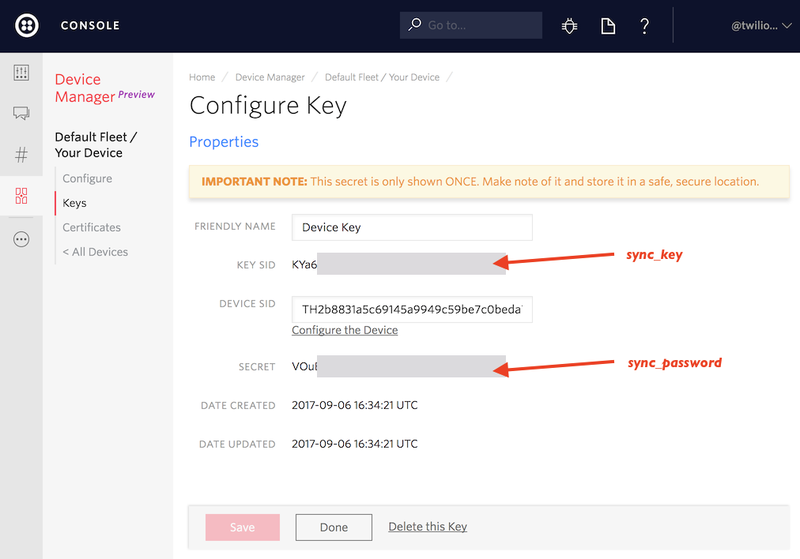 In Arm Mbed, you'll be copying the Device Key and Device Secret that you just created. Keep them handy for that step. A Document is the simplest type of object in Sync (excellent for LED state tracking!). You will have to create a document before you connect to Sync. The Document name will map directly to a MQTT topic name, and you'll subscribe in the code. Name your Document 'BoardLED' (match our capitalization). We initialize led key to value OFF and create a new document BoardLED. For this guide's development, we used a Multi-Tech MultiConnect® DragonflyTM with the Arm Mbe IDE. For an overview of connecting to Mbed with this board, please see this page. For help setting up the dev board, SIM, PCB antenna, or modem find Multi-Tech's instructions here. At that link, simply follow the yellow 'Import into Compiler' button and IDE prompts to load our code into your workspace. Above, you created a new device key and saved the lkey and secret somewhere safe. Now, edit the lines at the top of main.cpp which ask for those credentials. 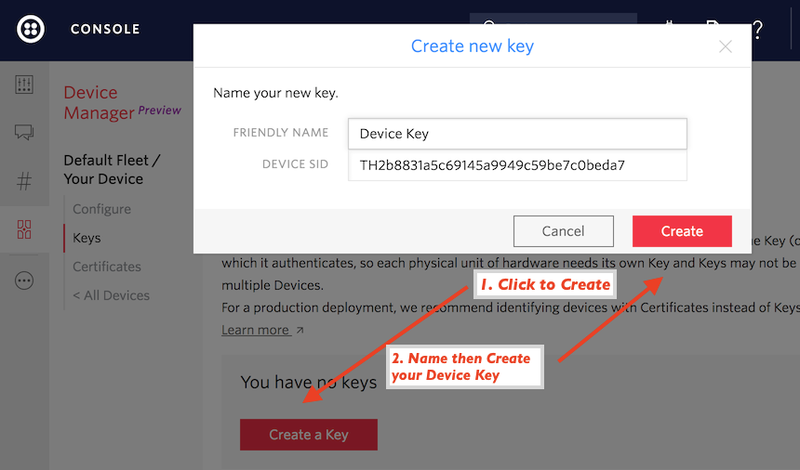 Paste your generated device key and device secret into Arm Mbed. Excellent - that's all you actually need to do to get the demo going! We used four libraries for this demo today. Please note that while our code is licensed MIT, not all other libraries share this license. Be sure to research the suitability of all relevant licenses when developing using our code. We're getting close now - it's burning time! Inside Mbed, click the 'Compile' button. Mbed will compile your code for the DragonflyTM and produce a binary file for uploading. While your board and dev kit are connected to the computer via USB, upload the binary file to the enumerated USB storage device. When complete, hit the white reset button to load the new binary. Optionally, now open up a serial monitor to listen to the board. On Windows we like PuTTY, and on *NIX we prefer screen. But wait - those newly scrolling messages aren't the demo! Let's blink one of the LEDs onboard that dev board. Set 'led' to 'ON' in the Document you created above. If you look in main.cpp, there are commented lines which would send updates back to the Document. Remove the comment block to send a msg back to Sync periodically. Whatever you send back to Sync should be in JSON format. 4G speeds, blue LEDs, scalable infrastructure - awesome, isn't it? While we know that your application is going to go a lot further than blinky lights, the same infrastructure you just built can scale to crazy heights with you. Scale far and wide - build dashboards, synchronize hardware, or... well, you decide. Wherever your business or project takes you hit us with your tweets on Twitter. We can't wait to see what you build!